Laureati, M.*, Spinelli, S., Monteleone, E., Dinnella, C., Prescott, J., Cattaneo, C., Proserpio, C., De Toffoli, A., Gasperi F., Endrizzi, I., Torri, L., Peparaio, M., Arena E., Bonello, F., Condelli, N., Di Monaco, R., Gatti,E., Piasentier, E., Tesini, F., Pagliarini, E.
The aim of the present study is to explore the association between food neophobia and chemosensory responsiveness and to determine whether this association translates into different food liking and preference patterns. Data were collected on 1225 respondents (61% females, age 20–60 years) as part of the Italian Taste project. Respondents completed the Food Neophobia Scale (FNS) as well as a food preference and familiarity questionnaire for a number of foods and beverages categorized as mild or strong tasting. Moreover, they evaluated attribute intensity and liking of an actual food (dark chocolate pudding) varying in the level of sweetness, bitterness and astringency. Taste function was evaluated by measuring fungiform papillae density (FPD), responsiveness to PROP (6-n-propylthiouracil) and to water solutions representing various oro-sensory qualities. High, medium and low neophobic subjects did not differ for FPD and chemosensory responsiveness. Reported liking was significantly lower for high neophobics than low neophobics mainly for those vegetables and beverages characterized by high levels of warning stimuli (i.e. bitterness, sourness, astringency and alcohol), whereas almost no differences were found for the bland versions of food items. High and medium neophobics rated astringency and, to a lesser extent, bitterness of the dark chocolate pudding, as more intense than low neophobics and liked the most bitter and astringent variants significantly less than low neophobics. Differences in liking, however, do not seem to be mediated by high food neophobics’ superior taste functioning but rather by higher levels of arousal when eating food and/or drinking beverages that are perceived as unpleasant and potentially dangerous. 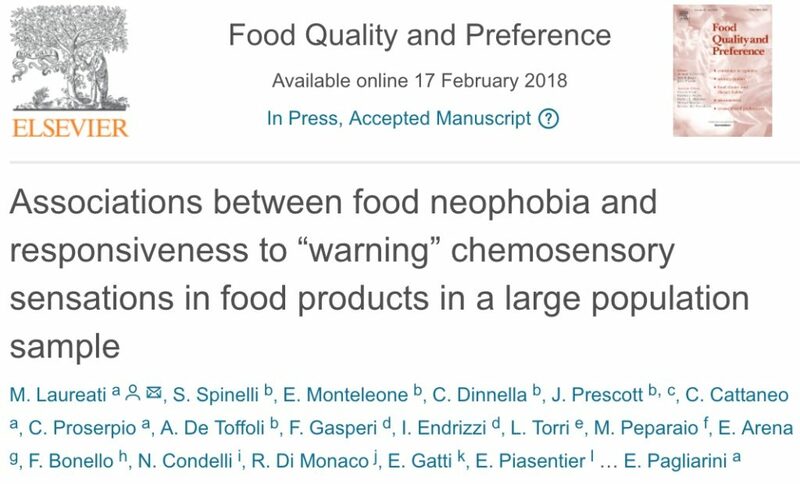 Finally, the effect of food neophobia was evident not only for unusual items in the Italian food context, but even for items that might be considered highly familiar. Questo articolo è stato pubblicato in Pubblicazioni . Bookmark permalink .